Icelandic crime is big at the moment, what with Trapped reaching its tense conclusion on BBC 4 the Saturday before last. But I have been a fan of Icelandic crime for quite a while – ever since I read Quentin Bates’s first novel, Frozen Out, published around five years ago. 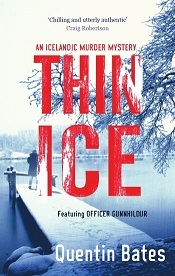 I’ve read everything he’s written since then, and I’ve interviewed him on the blog, so I was delighted to be sent a review copy of his latest, Thin Ice. For my money Officer Gunnhildur is one of the most appealing detectives currently on the scene. Gunna is an appealingly down-to-earth figure, middle-aged, not exactly chic, working hard to do a good job as a police officer, while managing a rather complicated family life. In Thin Ice, a couple of crooks rip-off a drug dealer and are dismayed to find that their getaway driver has disappeared. They highjack a car containing a wealthy woman and her daughter and end up snowed in at an off-season holiday resort. It soon becomes clear that the villains have made a serious error of judgement and that one of their hostages has more than one trick up her sleeve. Meanwhile Gunna and her colleagues are investigating the disappearance of the women and the death of a thief in a house fire, unaware that they are related. The different threads of the story are woven skilfully together. It’s a good pacy read, well constructed, with some very unpleasant characters that you really hope will get their comeuppance – and there’s a nice sting in the tale. Quentin Bates writes about Iceland, the food (sheep’s head, anyone? ), the weather, and the social mores with an unshowy confidence that comes from ten years living there. Well-written, satisfying, thoroughly enjoyable. I’m looking forward to the next one. I just finished Frozen Out (title Frozen Assets here) and I agree, Officer Gunnhildur is very appealing. I have been trying hard not to get hooked on new (to me) series, but as soon as I finished that book I was talking about finding the next in the series. Looking forward to reading more of them. I know what you mean! I sometimes feel the same. But this is a series I’ve let myself follow.